What Happens When You Mix Alcohol with Prescription Drugs? 56% of U.S. adults over the age of 21 drink alcohol at least once per month. Drinking alcohol in moderation is a safe practice for millions of people. But about 16 million people in the U.S. struggle with alcohol use disorder. Problem drinking can take many forms, including dependence on drinking, drinking to extreme levels of intoxication, and mixing alcohol with prescription drugs or illegal drugs. Prescription drug misuse is, unfortunately, common in the U.S. Misuse includes mixing prescription drugs with alcohol to get high. Also, people who struggle with alcoholism and are prescribed medications may be unable to stop drinking while taking a prescription. If someone is struggling with alcohol use disorder, they can experience many adverse health consequences when they mix their legal prescription drugs with alcohol. What are the dangers of mixing prescription drugs and alcohol? When someone mixes drugs with alcohol, they can experience many different side effects, which can vary in intensity and danger. Alcohol can prevent some prescription drugs from working. Alcohol can raise the levels of drugs in the bloodstream to toxic levels. Who is most at-risk for mixing prescription drugs and alcohol? Being young, between the ages of 18 and 25. Not graduating from high school. Having a pattern of heavy drinking or binge drinking behaviors. What prescription drugs should someone never mix with alcohol? There are many different prescription drugs that someone should never mix with alcohol. It’s important that patients talk to their doctor about their specific prescriptions and if medicines will interact poorly with alcohol. People who struggle with alcohol dependence and addiction, and also need to take prescription medications need treatment for alcohol use disorder. Continuing to drink while taking drugs for various health problems can worsen health outcomes, and patients can risk dangerous side effects when mixing alcohol and prescription substances. The following prescription medications are the most likely to interact dangerously with alcohol. People who take allergy medications and multi-symptom cold and flu medicines should avoid drinking alcohol. The most common symptoms include dizziness and drowsiness, and also impaired judgment. These interactions can make it incredibly risky to drive or operate heavy machinery. Drinking excessively while taking these prescriptions also increases the risk of overdose. Combining alcohol with antibiotics can cause many dangerous symptoms, including increased blood pressure, heart rate, stomach upset, headache, and liver damage. Anti-anxiety and epilepsy prescriptions can cause many different, dangerous side effects. The most common side effects when mixing these medications include slowed breathing, difficulty breathing, memory loss, drowsiness, dizziness, and liver damage. Ischemic chest pain is also called angina, a type of chest pain caused by reduced blood flow to the heart. Mixing angina medications with alcohol can cause tachycardia, dizziness, fainting, and changes in blood pressure. Alcohol and sleep medications cause slowed breathing and impaired motor control when taken by themselves. Combining these two substances can magnify these symptoms to dangerous levels. People who combine sleep aids with alcohol also risk memory loss and fainting. Both alcohol and prescription pain medications cause slowed breathing and impaired motor control. Combined, users are at increased risk of overdose. Mixing these two substances can also cause memory loss. 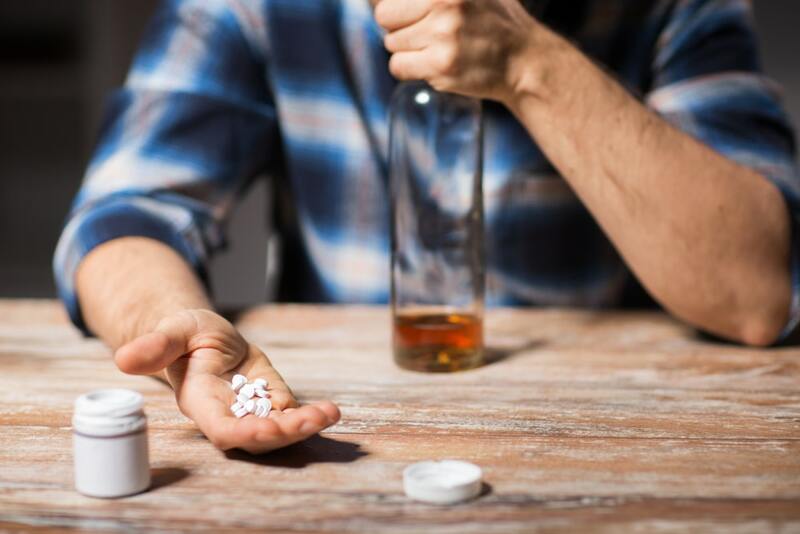 A 2017 study from the American Society of Anesthesiologists found that combining even small amounts of alcohol with prescription oxycodone led to dangerous levels of depressed breathing. Oxygen deprivation is the number one cause of death in prescription opioid overdoses. Mixing prescription muscle relaxers and alcohol can cause impaired breathing, dizziness, memory loss, and dangerous seizures. Drinking while taking a prescription for high blood pressure can cause fainting, dizziness, and an irregular heartbeat that can increase the risk of stroke or heart attack. Combining alcohol and prescription heartburn medication can cause sudden, dangerous changes in blood pressure and tachycardia. Mixing alcohol with diabetes medications can lead to dangerously low blood sugar levels. This effect can lead to nausea, vomiting, tachycardia, and sudden changes in blood pressure. Drinking, even occasionally while taking a prescription blood thinner, can cause internal bleeding. Heavy drinking can also cause internal bleeding, and increase the risk of blood clot formation. People who drink while taking a blood thinner are at increased risk of a stroke or a heart attack. Alcohol and cholesterol-lowering medications can lead to liver damage, internal bleeding, and itching. Combining alcohol with some of the most popular arthritis medications can cause stomach bleeding, liver damage, and stomach ulcers. Antidepressants taken with alcohol lowers the effectiveness of the prescription. MAOI antidepressants combined with alcohol can cause an increased risk of blood clots, and heart attack. Drinking while taking a prescription antipsychotic for schizophrenia or a similar mental health condition will make the medication less effective. Also, people can experience sleepiness and excessive fatigue when combining these two substances. For prescription medications to be most effective, it is crucial that patients take their drugs according to their doctor’s instructions. For many prescriptions, that might mean that a patient will have to abstain from alcohol. Abusing or misusing prescription medications can lead to addiction and dangerous side effects, including the risk of overdose. For people with a history of problem drinking and alcohol dependence, they will need to inform their doctor about these problems. It’s vital that these patients get help from a qualified addiction rehabilitation center. If you or someone you care about is struggling with alcohol or prescription medication abuse, please reach out to a drug abuse counselor today to explore your treatment options.